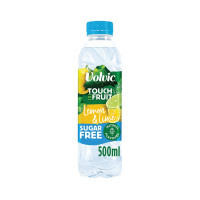 This unique blend combines the refreshing taste of Volvic still mineral water with a hint of lemon and lime for a delicious flavour. Sugar-free and free from artificial colourings, these drinks contain all the benefits of water with a touch of fruit for a healthy, tasty drink at work, home or school. This pack contains 12 plastic 500ml bottles.